At a time when consumer data, analytics and research are coming under increasing scrutiny, the U.S. ad industry is launching a new self-regulatory initiative to ensure its research supply chain complies with some basic ethical principles. The new "Member Code of Conduct" was conceived by and is being overseen by the Advertising Research Foundation (ARF), and consists of a set of principles protecting consumer rights, as well as those of businesses that use the research to market to consumers. The principles are based on best ethical practices, as well as U.S. laws, and will likely evolve as new technologies and business models create new methods of unlocking consumer data that can be used to target and market to them, says ARF CEO and President Scott McDonald. While advertising, media and marketing research have long utilized advanced behavioral science and technological methods to gain insights and competitive advantages about consumers, McDonald cited the acceleration of new technologies that are unlocking access to consumer data that raise new ethical questions -- especially things like AI, 5G, neuroscience and geolocation data that can pinpoint where people are, what they are thinking and even how they are feeling unconsciously. 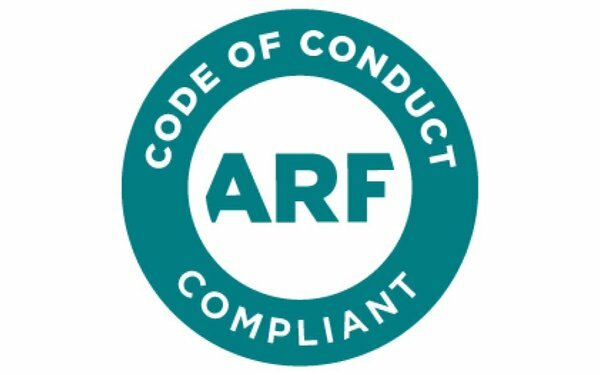 The new code is 100% voluntary, but the ARF has conceived of a method to give it some self-regulatory teeth in the form of a compliance seal of approval (see logo above) that the ARF will bestow to research suppliers who affirm their compliance. McDonald said the ARF will not audit suppliers, but will rely on whistleblowers to out companies that are not living up to the principles, operating more like the Better Business Bureau’s rating system. The idea, he said, is that companies losing the seal would be at a competitive disadvantage to companies that can brandish it. McDonald said there is no fee for companies to participate in the code or to utilize the seal. Details of the program will be discussed during the ARF’s upcoming AudienceXScience Conference April 15 and 16 in Jersey City, New Jersey. 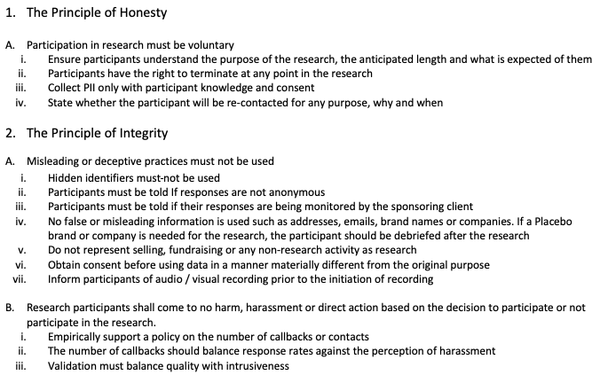 4 comments about "ARF Creates 'Code Of Conduct' For Consumer Researchers, Utilizes Seal Of Approval For Compliance". Gabe Samuels from Gabe Samuels, Media Consultant, April 2, 2019 at 3:25 p.m. This is not only timely, if not overdue, it is at the heart of what the ARF is all about. Outstanding! Tony Jarvis from Olympic Media Consultancy, April 2, 2019 at 5:15 p.m.
Gabe: As usual we have different perspectives although we agree that a Code of Conduct focussed on data privacy is long overdue after the Cambridge Analytica debacle. Your "outstanding" comment reminds me of the Trumper's interpretation of the AG's letter "summarizing" the Mueller Report. Suggest we wait for the full Report before passing judgment. Just for starters, "Self-regulatory teeth" is surely an oxymoron? Tristan Webster from TVision Insights, April 9, 2019 at 12:21 p.m.
Great initiative from the ARF! Critical step in increasing privacy, driving transparency/good research practices. Full support from me and the team at TVision. Gabe Samuels from Gabe Samuels, Media Consultant replied, April 9, 2019 at 12:55 p.m.
Tony: this time we Totally agree. I was a bit rash in “summarizing”. So I still think it’s a step in the right direction, but I’m anxiously awaiting to see the teeth.